The kati (pronounced ‘karti’) is as popular in India’s colonial-style clubs as it is on its rural railway platforms. While a paratha (flaky flatbread) sizzles on a hot griddle, it’s topped with beaten egg that sets to a thin omelette. 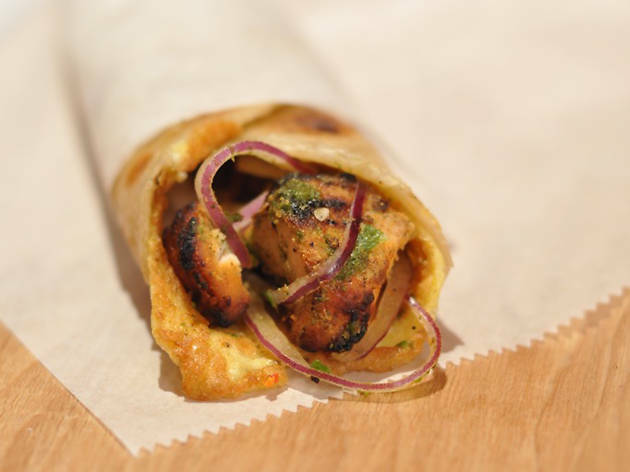 Garlicky chicken tikka, tangy stir-fried beef, mini lamb patties, paneer or spicy potatoes are put in the middle; add a flurry of red onion slices and a dollop of herby chutney, and the whole lot is then wrapped into a tidy roll. The cooks make everything from scratch using distinctive marinades and fresh, own-ground masalas. Main courses £3.50-£7.80. Set meal £12-£16 per person (minimum 2). Unlicensed. Corkage no charge. One of the great cheap eats in Soho. The rolls may look little, but they are deceptively filling. All rolls are made to order so they come piping hot. The decor inside transports you to the roadside of India and they serve Cobra and Kingfisher beer to accompany the rolls. This place is a great cheap eat in Soho. The food is good and relatively authentic. It's good value for money and although the portions look small, they are very filling. It can take a little time to make the roll so factor this in to any visit. Also, collect points with Swipii for extra rewards. I love this place! As soon as you walk in, it feels like you've stepped into a cafe in Mumbai! The decor is rustic Bollywood and the place is always packed! Rightly so as the Kati Rolls are delicious! It's cheap, cheerful and tasty fast food. 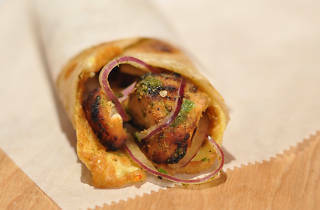 I went to Kati Roll company off the back of a Time Out review for a pre cinema bite. It's a reasonable distance from the cinema's so was quite an investment in the current horrid London restaurant. The menu is short and sweet - though in theory a choice of breads is offered. Though on ordering we weren't asked for our choice. Between us we had 3 Kati's two meat and a vegetarian. They were indulgent, buttery, well spiced and v tasty. They were perfect for a low cost, quick bite before the cinema. My only criticism really is that it is all calorie laden and no freshness in the form of greens, salad/yoghurt seems to be offered. It is a fast food place and the service is minimal and quite frankly unremarkable - very little greeting or interaction from the person behind the counter. In summary, a good find and worth remembering but I wouldn't especially put myself out to go again when there are other options closer to the cinema. Anything wrapped in a warm paratha is heavenly - my go to rolls here are the masala shrimp and unda chicken (egg and chicken). The rolls are not too big so I like to get two for a meal. The service doesn't seem to be streamlined, so the wait can be unpredictable for an otherwise fast & casual stop. I recommend getting a mango lassi to drink while waiting. Kati Roll is a quaint indian street food restaurant, great for a quick, flavoursome and inexpensive bite to eat, just off Oxford street. 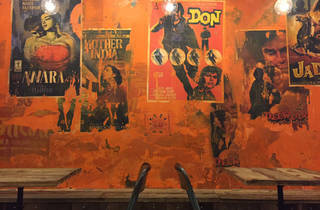 Stepping into Kati Roll is like stepping into, what I imagine to be, a little shack in India - graffiti and Bollywood posters line the interior walls. For a vegetarian/pescatarian, there are a handful of choices. I generally go for either the mixed-veg roll or shrimp masala. Great tasting and cheap! All the rolls here are great (yes, I’ve tried them all, judgey!) 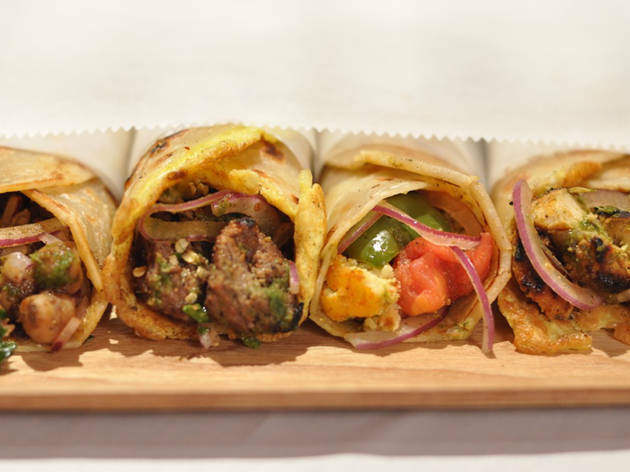 my particular faves are the Unda Beef, Shami Kebab and Shrimp Masala rolls. What I would LOVE is a mash up of the Unda Aloo and Beef … Shahin, make it happen dude. Cheap and cheerful, great for lunch or a quick bite! 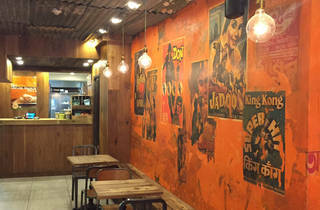 Kati Roll Co. is handy to know about when you want a quick quality meal away from the hoards on Oxford Street. 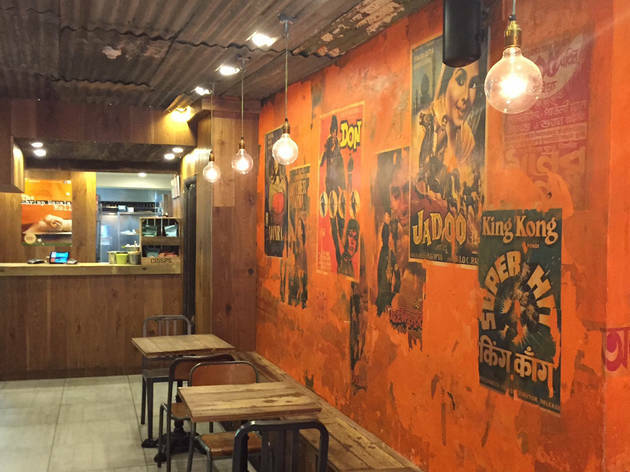 It's tucked away just off the shopping street and serves delicious Indian street food style wraps. They're relatively small so two makes for a good meal, costing about £9. I tried the paneer wrap and mixed vegetable one. Both were nicely spiced but I preferred the paneer. My friend had the unda chicken which was also delicious. The chai was really nice, served unsweetened and for just over £1 it was great value that I would go back for as take away whenever I'm in the area. They also sell beer and mango lassi but apart from that, the showcase is the 13 types of Kati roll to choose from. A casual lndian street food diner with seating. 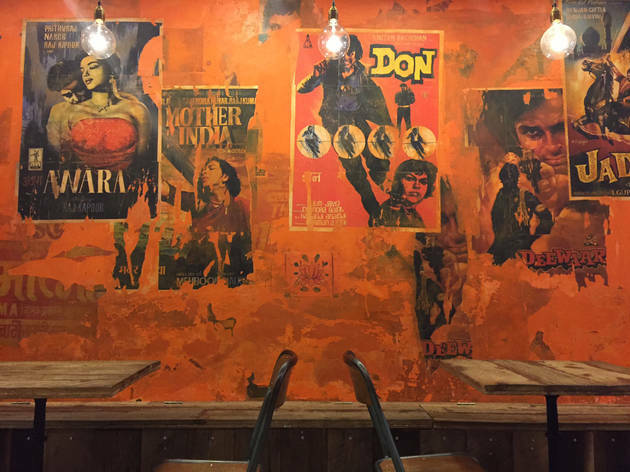 The interior is thoughtfully designed like a shack with graffiti and Bollywood movie posters. The food wasn't very quickly prepared and often Deliveroo drivers would come to pick up orders which suggests that they had a high number of orders to fulfil. The staff weren't all that friendly either. Where they lacked in service they definitely made up for it in flavoursome food. The Alfonso Mango Lassi was thick, creamy and crucially not too sweet. 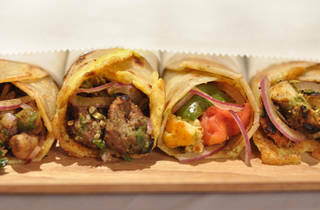 From the long list of rolls, l finally settled for the unda shami roll- a delicious mix of lamb, lentils parantha roll. lf you're not in a rush then it's worth the wait. Went to this joint for a quick break, liked their Chicken Tikka Roll and Shami Kebab roll. Must try their Lassi. If you want a quick, easy, tasty lunch, dinner or snack, this is a great spot. I discovered it about five years ago and it’s still one of my favourite places to grab a quick bite. It’s very fast service, the food is incredibly tasty and it’s a great spot to take out-of-town friends. I would always recommend going for an option with unda (egg) as it really makes the dish. The meat is really succulent and considering it’s a fast food shop, it’s actually really high quality and prepared really well. Writing this has brought back all the tasty memories made me want to go right now… think I know what I’m having for dinner. Poor customer service. They don't even know how to speak with your customer. If you have zero respect in society or and in your on eyes then you should definitely visit this place otherwise find a nice place.